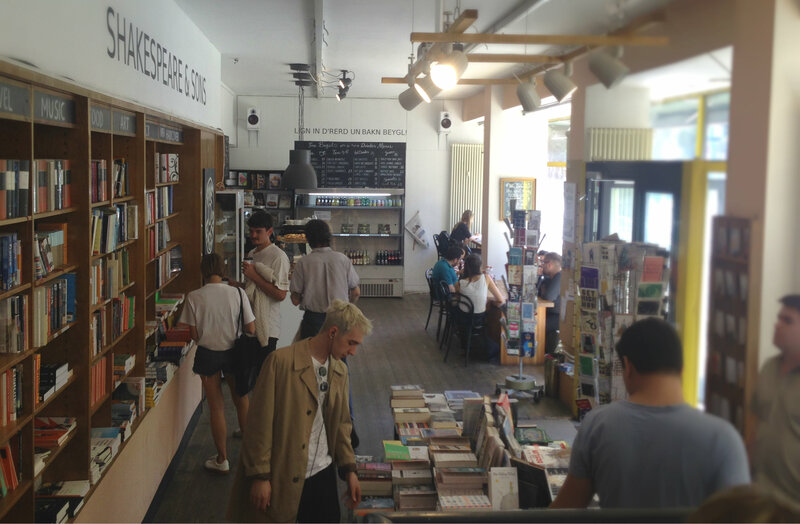 Behind its rough, grizzled exterior, Berlin is really a city of students and book nerds at heart. 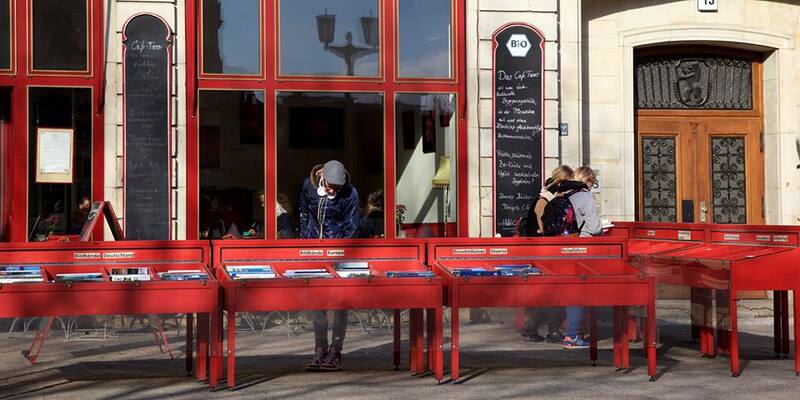 As the weather gets colder and it gets time to move inside from the parks and spaeti benches, check out our recommendations for the best bookstore/café combinations in Berlin. 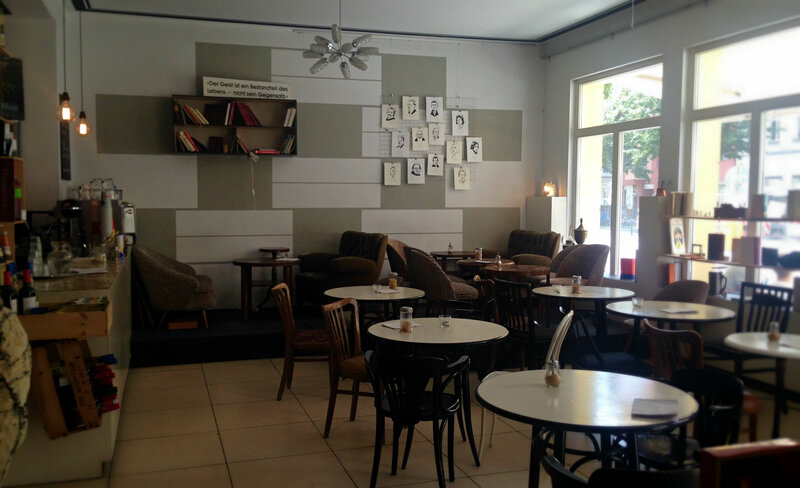 This unpretentious café in Prenzlauer Berg is just a short walk from Bernauer Strasse, serving up the usual Milchkaffee and assorted pastries (although you can get sandwiches, too!) The real treat is the atmosphere – it’s the kind of bookstore/café where no one is worried about how long you’re hanging around, making it the perfect place for a meeting with your tandem language partner or Tinder date. Some of my latest finds in their used book section – German classics (written in beginner German if you still need to practice) and a whole shelf of Portuguese and Spanish novels. Shakespeare & Sons is known by bookworms and non-bookworms alike for for one thing: amazing bagels. The heavily curated selection of books – everything from Bulgakov to Anthony Bourdain, German film to Japanese manga classics – feels a bit like checking out the bookshelves at a party in a trendy New York apartment. Love it or hate it, Shakespeare & Sons keeps it all about the books and good old fashioned conversation by limiting WiFi to specific hours and keeping the back room laptop free – finally, an excuse to get some reading done! With warm walls, mismatched chairs, and location just around the corner from Frankfurter Tor, café Tasso feels like a relic from the days before Friedrichshain was filled to the brim with hip cafés. The back rooms are packed with used books, with a room in the basement dedicated to English language books, all for only €1.50 (recently up from just €1 a book), so it’s impossible to leave empty-handed (and if you’re like me, maybe with a stack of books about Berlin history and pre-war photographs). Bonus: go with a fellow book lover on a lazy weekend morning and grab the Tasso breakfast for two – you’ll get in some great people watching on Karl-Marx-Allee and get all the energy you need to explore every shelf. If you’re into minimalist style, strong espresso, and Moleskine notebooks, Ocelot (“Not just another bookstore!”) might be more up your alley. Just down the street from Handbestand, it’s a great spot for some post-Mauerpark caffeination. Their selection of books is infinitely hip and design-centric, with a heavy selection of glossy art and architecture books. Ocelot’s advantage? Tons of books in other languages (from Greek, Spanish, Turkish, Polish, and more) as well as language coursebooks, means you’ll be sure to find something to practice your language skills apart from DuoLingo. 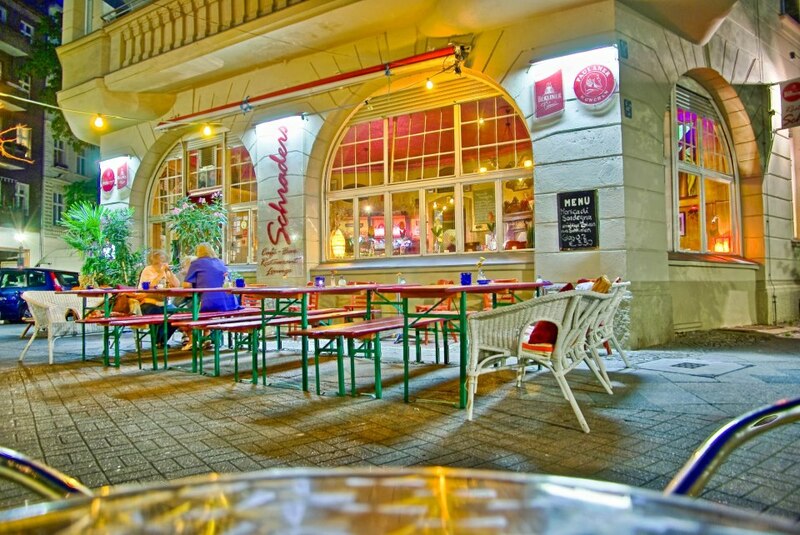 For more on what to do around here, check out Neighborhood guide to Brunnenstrasse. Photo from Ocelot’s Facebook Feed. Maybe you’ve been around the block, and the suggestions above aren’t news to you. Antiquariat Mackensen & Niemann, in between Seestrasse and Nauener Platz, is a true hidden gem and the perfect place to spend a rainy day. This place is filled with antique books, surprising vintage finds, and unlike the places above, has a true local following. If you’re an art lover, this is the place for you – you’ll find huge photography books and exhibition retrospectives for a fraction of the price. OK, so it’s not technically a bookstore/café combination, but it might as well be – Schrader’s, a Wedding institution and one of the most popular neighborhood cafés – is just across the street. Here are some more ideas on things to do in Berlin Wedding. Photo from Schrader’s Facebook Page. 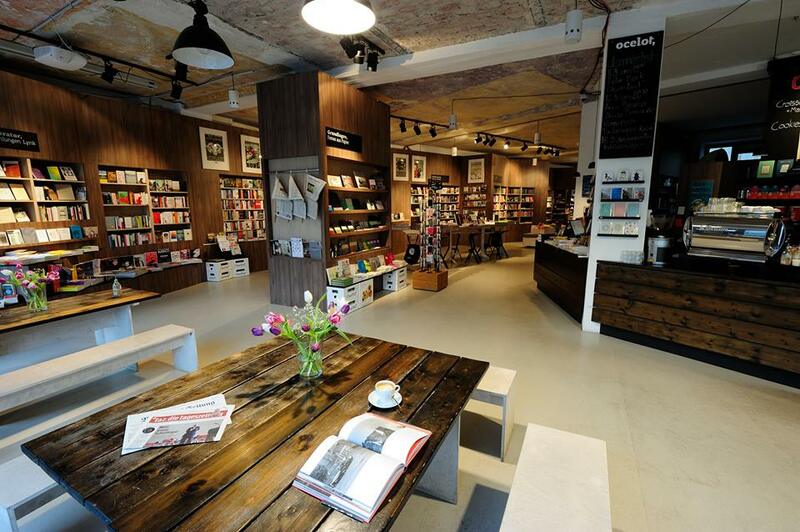 If you feel like a more “corporate” and super bookstore/café combination, then Dussmann in Mitte is the place to go. This bookstore has, for the longest time, been the reference in Berlin for all sorts of book needs. Browse through the many floors before finding a perfect spot at their downstairs café, right by a most wonderful green wall! Yes, given its lcoation and fame, this bookstore might feel a bit too mainstream. 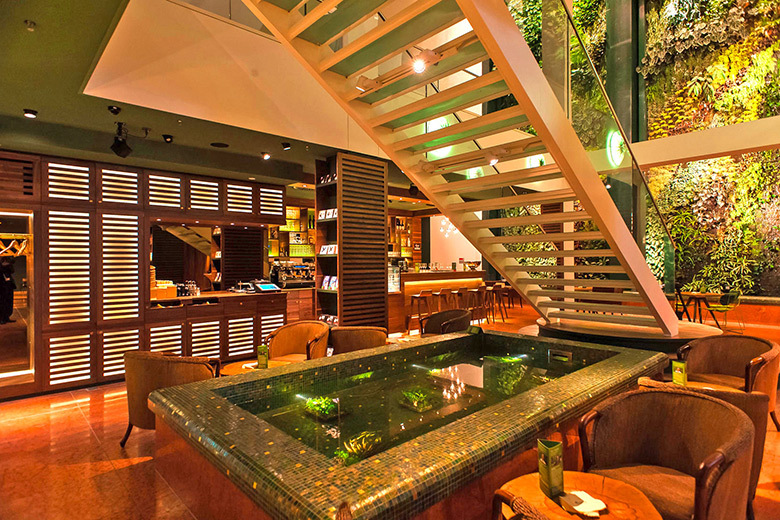 The café, however, will transport you to somewhat of a hidden urban oasis. Trust. Do you have a favorite bookstore or café in the city? Tell us in the comments below! *Article written by Olea Morris and edited by Tulio Edreira.